I am often contacted by many brides to be that are looking for a wedding photographer in Danbury area. 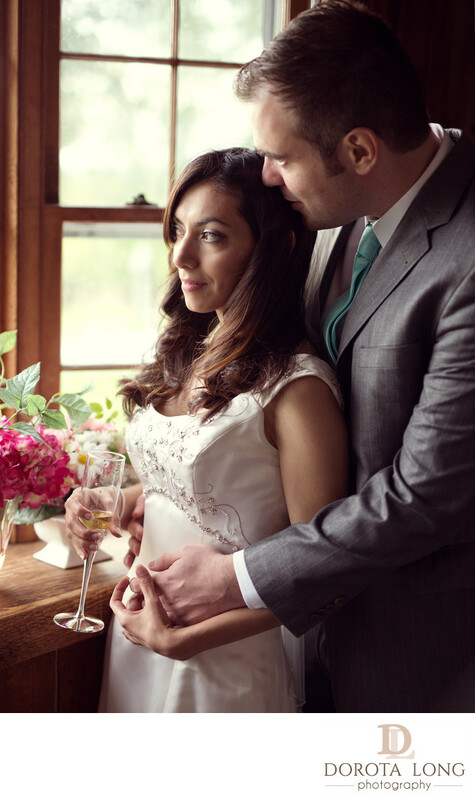 This couple was actually getting married in a venue in New MIlford, CT but because Danbury is a larger city, they decided to search for their wedding photographer in Danbury. For this image, I did not use any additional light, even though I had it in my bag. I decided that it was enough to use a window light. The venue was rather small but there were quite a few large windows everywhere. I used it to my advantage. At the end, I did end up using an off camera flash which I bounced off of a white ceiling but for this candid moment I only used natural light. The couple was standing in front of a large window just enjoying a quiet moment with each other away from everyone. I always have my camera ready and look for moments like this. I try to be as unobtrusive as I can and look for ways to stay out of their view so that they can be natural. Here they did not realize I photographed this moment and they told me later how surprised they were to find this among their wedding photos. They loved it and decided to include it in their wedding album. The venue name: Candlelight Farms Inn. Location: 25 Lake Ave Ext, Danbury, CT 06811, USA.